New York Fashion Week: Leanne Marshall Fall 2010 | Fashion. Style. Beauty. | Life is short. Live well. The Scene: This season, Leanimal held her show at the Union Square Ballroom. 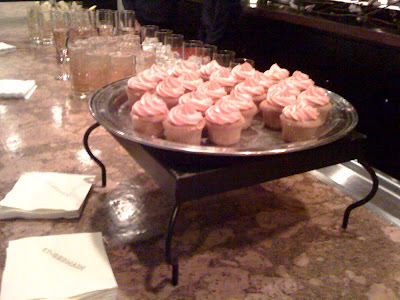 The runway was quaint, as was the atmosphere, with a bar offering fancy cocktails, plenty of pre-show mingling space, and cupcakes! Overheard In The Crowd: Since there was no usual tent hustle and bustle, the conversations remained pretty laid back. People were mostly commenting on the delightfulness of the sake and ginger-ale cocktails. The Collection: From the get-go, it was obvious that Petals Marshall has graduated to more sophisticated shapes. Intricate layered cutouts were seen on mini dresses, skirts, and long gowns. There was great attention paid to the detailing of the more formal pieces, however, when it came to casual separates, the oversized tulip shaped hoodies began to resemble well-draped Snuggies. Trend Spotting: Subtle details, voluminous draping, and over-the-knee socks paired with boots. Overall Impression: Leanne is definitely progressing without going too far out of her comfort zone. She was able to communicate her talent for detail effectively while keeping the clothes wearable and feminine.